In February 1977, IPC Magazines first published a new weekly British comic anthology featuring various separate science fiction stories. Consequently, it was given the then futuristic name 2000 A.D. Although this suggests that nobody expected the title to last as long as the new millennium, it is still published by Rebellion today. Among the anthology’s recurring features were Tharg’s Future Shocks and Tharg’s Time Twisters. The eponym of these series is an alien from the fictional planet Quaxxan, which allegedly orbits the factual star Betelgeuse. He rarely appears in stories himself. Instead he functions as avatar for the editor. In this role he introduces features, answers letters, and presents competitions to the readers. He frequently uses “alien expressions”, such as “zarjaz” which translates as “fantastic”. These are so important for the anthology that 2000 A.D. published regular glossaries of these alien terms (Parkin 2009: 40) and some of them are now collected in a website-phrasebook (25 October, 2013). The fictional production hierarchy with its references to an alien background not only serves as a self-referential running gag and marketing instrument, but also highlights the supposedly futuristic character of 2000 A.D. Although Tharg allegedly abuses his “robots”, by forcing the writers and artists of these features to work overtime for little reward under constant threat of collective disintegration, the anthology’s short stories proved to be an excellent platform for aspiring authors. Here they could experiment and refine their technique with less pressure than work on a major series would have placed on them. Furthermore, the limited space of two to five pages forced them to use their resources effectively. Characters and settings had to be introduced as in any longer text or comic, while the initial idea was brought to a satisfactory conclusion. 2000 A.D. consequently gained a reputation as a springboard from which British talents could launch their careers in a larger market. While artists such as Kevin O’Neill and Dave Gibbons were part of the anthology’s initial line up, now highly acclaimed authors like Neil Gaiman and Alan Moore produced early works as “writing robots” in the service of Tharg. Gary Spencer Millidge (2011: 59 – 62) considers Alan Moore’s decision to focus on writing and his ensuing work on these short comics to be major steps in the author’s career. However, the first project in which Alan Moore solely appeared as author was Black Legacy, which was published in Marvel UK’s Doctor Who Weekly in June 1980, a month before his first Future Shock (Parkin 2012). Alan Moore scripted further stories for both companies and additionally started writing for Warrior in March 1982, where he reintroduced Marvelman and created V for Vendetta. Although this anthology was a rival product of 2000 A.D. and the author wrote his last short story for Tharg in September 1983, Alan Moore successfully continued to work on different series for the title – such as D.R. and Quinch and The Ballad of Halo Jones. 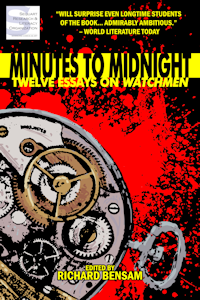 The author’s 2000 A.D. short comics were collected and published in two volumes named Alan Moore’s Shocking Futures and Alan Moore’s Twisted Times in 1986 and 1987 – the same years his acclaimed mini-series Watchmen was first released by DC. 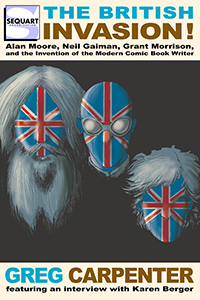 Additionally, in 2006 Rebellion issued Alan Moore’s Complete Future Shocks, which was republished in 2011. This compilation included the Future Shocks and Time Twisters of the previous two compilations, plus a mini-series on Abalard Snazz and other short stories originally written for 2000 A.D.
One of these Time Twisters written by Alan Moore is Chronocops. This five page comic was first published in 1983 and features Joe Saturday, a policeman fighting crimes committed by people traveling through time. Consequently, the comic has many opportunities to play with different temporal concepts, as do the other short stories belonging to Tharg’s Time Twisters. Past and future meet frequently. Wordplays, which are characteristic for Moore’s oeuvre, and various details in the illustrations, allude to different aspects of time. Even the layout of the comic provokes closer deliberations on how graphic literature produces a chronological continuity and how this is received and understood by its readers. This paper analyzes how time is represented in Chronocops and how the above-mentioned aspects are used to discuss it and its functions. Furthermore, the story’s place in its author’s oeuvre and various connections between this specific Time Twister and other comics – both older and younger – shall be examined. This closer scrutinizing is of special interest, because Alan Moore’s early works in general and Chronocops in particular have not yet received the academic attention one might expect for an author of his reputation. Chronocops is a wonderful example on how comic authors and artists used the short stories in 2000 A.D. to perfect their methods of storytelling. Artist Dave Gibbons exclaimed in an interview about his collaboration with Alan Moore, that he particularly enjoyed working on Chronocops, “which is a really involved tale of time travel, where people meet and hide from themselves and all sorts of shenanigans” (Thill 2008). He and Alan Moore repeatedly manipulate the chronology and structure of this story, revealing their own fascination with complex, layered narratives and the phenomenon that is time. The comic’s plot is based on the hardboiled 1950’s detective series Dragnet. This becomes apparent from the beginning of Chronocops. The first panel shows a close-up of the story’s main character, Joe Saturday. His features will remain set in the same emotionless expression for most of the comic. Additionally, all of his texts, including the captions of the comic, are reminiscent of the short-spoken voice-overs known from these criminal stories. This is highlighted by the self-referential gag during his introduction: “I’m a cop. [...] I speak in short sentences” (1). He also announces himself and his partner, Ed Thursday, as paradox police (1). 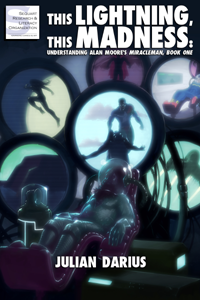 A description which initially seems accurate as they stop a futuristic punk from killing his own great grandfather on the very first page of the comic. This variation of the grandfather paradox apparently confirms the role and necessity of chronocops. It seems as if they need to intervene to prevent changes in history. Accordingly, their operation against Quarmsley Q. Quaalude in 1968 is followed by further cases in which the duo prevent temporal crimes. First they sort out a combustion on a crossing of time traveling routes in 1997 (2 – 3), then they go after the long-term interest bandit Yolinda Y. Yorty in 1989 (4). The entire plot seems to be dependent on the notion that paradoxes are a realistic threat resulting from time travel that needs to be prevented. However, the depiction of these cases in Chronocops and the way in which they are connected provoke an entirely different conclusion. While dealing with the aforementioned traffic issues Ed Thursday is assaulted by a vengeful driver named Zanzibar Z. Ziggurat, although he claims never to have met his attacker before (3). This confuses the policeman greatly and leads him to the attempted arrest of the wrong baby, when he and his partner go after Yolinda Y. Yorty in 1989 (4). The mishandled child turns out to be the man that assaulted Ed Thursday in 1997. This was previously hinted at by the conspicuously similar patterns of the baby’s pajama and the extravagant shirt worn by the grown-up Zanzibar Z. Ziggurat. Consequently, the reason for his anger and attack become clear, as do its consequences, which the assailant seems to be fully aware of (3). The entire incident is based on circular causation, with Ziggurat’s attack provoking Ed’s error and vice versa. The comic’s plot accords with the self-consistency principle established by the Russian physician Igor D. Novikov. This states that events on a closed timelike curve influence each other in a self-adjusted, cyclical and self-consistent manner (1983: 169). Consequently, the universe depicted in the strip has one single, unchangeable history in which any actions taken by time travelers have existed all along, as have any other occurrences. This renders most paradoxes, including the grandfather paradox, impossible. However, it does allow circular causation, as even a causal loop without a determinable starting point or end remains self-consistent. Accordingly, the existence of paradox police seems unnecessary in such a universe, as any crime connected to time traveling which the officers cannot prevent has been a part of its history all along. This suggests that Chronocops is set in a block universe, in which time is considered to be a fourth physical dimension with a similar ontology to space. This suits comics especially well, as it lies in the very nature of the medium to depict chronological developments as a spatial phenomenon. By sequencing its panels, which frequently show causal chains in one single image, the medium articulates the temporal progression of the narrative. This allows the unique possibility of presenting the past, the present and the future on the same compositional unit, respectively page (McCloud 1993: 104). Consequently, Will Eisner described the depiction of temporal developments in this medium by quoting Albert Einstein’s Special Theory of Relativity which states that time is relative to the position of the observer (Eisner 2004: 25). How strongly the aforementioned ideas apply to the comic’s plot and universe – despite the existence of chronocops therein – becomes apparent through the usage of two different sets of identical panels, which show the comic’s main characters interacting with themselves. One of these appears on pages two and five showing Joe and Ed meeting their time traveling selves before and after the arrest of Quarmsley, as well as their return from capturing Yolinda. The same people meeting and influencing themselves on different positions of their own respective world lines does not cause any problems or second thoughts with the chronocops. Additionally, both of these panels are used to highlight important details, like the date of the punk’s failed attempt on the life of his grandfather. All of this, as well as the amount of advance information provided by the comic’s creators throughout the story, becomes even more evident in three identical panels on pages two, three and four. On these Joe and Ed return from the traffic combustion and advise their past selves to take along some steak as Ed will get a black eye. Moreover, they reappear at the same time, zero-zero fifty-five, when they rush back from the canteen. Since they hide behind a plant to avoid confusion, most readers will only spot them when the third identical panel is read for the first time. Because this also appears very closely after its penultimate version, both their identicalness and the time loop represented by them are highlighted for the readers. The layout of the story plays with western conventions of reading. As Scott McCloud correctly observes our conditioning to go through literature, be it graphical or other, from left-to-right and from top-to-bottom allows comic creators to play tricks on us (McCloud 1993: 105). Accordingly, these panels function as visual gag with a lot of references only becoming apparent when they are repeated, since the readers were looking for something else when the panels initially appeared. Only the narrative allows the reader to fully comprehend what is shown. By acting as a link between the different policing operations and appearing on most of the panels featuring more than one set of officers, a piece of steak functions as indicator for the way in which different world lines keep overlapping and crossing in Chronocops. When reading the comic in the usual fashion the warning to pick up the meat issued by Joe standing at the side of his black-eyed partner is depicted first (2). This is followed by Joe handing it to Ed after the latter got hit (3). Then the warning is expressed, before they actually buy the steak in the canteen, parallel to Ed nursing his black eye with the meat while sharing a drink with his colleagues in the foreground of the same panel (3). Finally, the hiding officers watch themselves warning their other selves to get the steak before they go on their mission (4). 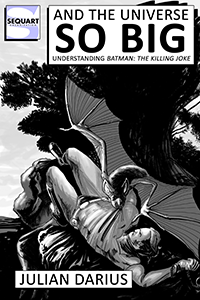 As the following caption mentions a stake-out the meat’s appearance in the comic is additionally shown to be a pun. The repeated appearances of multiple versions of Joe and Ed show that the alleged new twist in the art-fraud business (4) is physically unproblematic in the universe of Chronocops. Multiple versions of the same object or person can exist at the same time. By taking the Mona Lisa off the wall and replacing the painting a split-second later no direct changes are caused to history. The piece of art retains its own world line which occasionally crosses itself. This is plausible as the causal loop remains self-consistent and intact. The scheme of interest bandit Yolinda Y. Yorty is a different matter. She does not cause any paradoxes by depositing the pound in the present and collecting the interest in the future. By returning with her accumulated savings she could cause economic havoc though, for example a heavy inflation in the present. This seems to give chronocops a useful purpose. However, if we assume, that there is only one unchangeable history, the logical consequence would be that the future is equally set. Any time traveler returning from the future would be as incapable of changing his own period’s history in our present, as temporal voyagers from our age could alter theirs in the past. Therefore time police have to be considered unnecessary and their depiction in Chronocops a parody on the recurring presence of such officers in science fiction stories. The repeated use of such policemen seems to be a desperate attempt by authors of trying to allow both free will and time traveling in their stories (Nahin 1998: 289 f.). A more logical solution for this conundrum would be the implementation of parallel universes developing with every journey made, as quantum theory suggests (Deutsch 1997: 310 f.). Although, Alan Moore implements such a multiverse in other stories, like The Startling Success of Sideways Scuttleton, another 2000 A.D. Time Twister, it is not applied in Chronocops. Unfortunately, how the protagonists travel through time is not explained in the comic. A clue is given when the officers hurry back from the canteen and return to the lobby a bit too early (3 – 4). Mathematics suggests that material objects could travel into the past by moving faster than light (Nahin 1998: 476). However, according to special relativity it would take an infinite amount of energy to accelerate matter to the speed of light, let alone a higher speed, so the hurrying must refer to an error caused by haste which sends them back a little too far. Additionally, the protagonists seem to travel stationary as they appear and disappear with a loud “FWARP” while standing still (2 – 4). This would prevent their trip. Spatial displacement is a prerequisite for all known theoretical models of time traveling (Nahin 1998: 23). Therefore another method of temporal voyaging which is depicted in Chronocops seems more plausible. At the temporal crossroads of 1997 (2) a variety of different vehicles are shown. However, no explanation is offered on how these crafts function or why the paradox police do not need any mechanical aid for their journeys while others do. Perhaps the sheer variety of contraptions is a clue to the nature of chronomotion in the comic. This diversity might suggest a natural form of time traveling, which would not suit any known physical models for our own universe. As no further proof is offered for this reading of the comic’s universe, time traveling in Chronocops can only be considered as literary device without closer physical explanation. The discussed panel does, however, illustrate the four-dimensional nature of the story’s spacetime. The similarities of the properties given to time and space in this comic are so close, that one-way centuries are used for time traveling and detours can be made through 1645 if 1997 is too congested (3). Still, time remains fickle as an accident in the twentieth century can result in an involuntary appearance of the crashed vehicle during the battle of Hastings (3). Another phenomenon related to time traveling appears in a caption on the last page of Chronocops: “We called it a day. Actually, it was a para-temporal duty period of forty minutes duration, real time. We called it a day. It was easier,” (5). This statement illustrates the difference between the proper time of the time travelers and the one of those people who remained in one place and one period all along. While the paradox police did a full day’s work, only forty minutes passed for the other people. This is a similar phenomenon to the dilated time experienced by the pilot of a space ship, whose watch will not have moved onward as far as those of the people that stayed behind on Earth (Nahin 1998: 26). Tagged Alan Moore, Chronocops, Dave Gibbons. Bookmark the permalink. Scott Brand received an M.A. in History in 2011. He is currently based in Zurich, Switzerland. He has presented and published academic papers on various aspects of popular media, including the works of Alan Moore. There are no plans to stop doing so in the near future. More information on the author can be found on: scottbrand.jimdo.com. 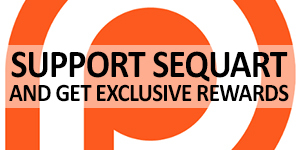 See more, including free online content, on Scott Brand's author page.